Last year a group of unlikely allies came together to create the coalition called Stop Mega Comcast to, well, stop the creation of the Comcast-Time Warner Cable mega company. This year, a similar group of improbable allies have come together to oppose the latest big-cable merger between Time Warner Cable, Charter, and Bright House Networks. 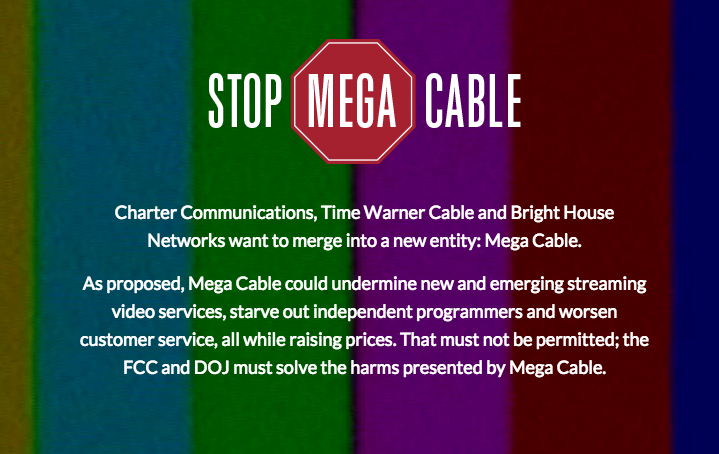 Similar to last year’s mission, the “Stop Mega Cable” coalition aims to raise awareness about the potential harms consumers face should Charter’s acquisition of TWC and Bright House be approved, while also calling for thorough investigations into the merger by federal regulators. The 17-member alliance includes media companies, consumer advocacy groups, and TV/telecom businesses. On the business side, Dish is the biggest headlining name. They are joined by trade groups representing mid-sized and rural communications companies. Advocacy group Public Knowledge is also in the alliance, as is Consumers Union. They are joined by the Writers Guild of America and by groups representing diversity interests, musicians’ interests, and sports fans’ interests. Chief among the coalition’s concerns is the fact that the merger would form a new “mega cable” company that would have a Comcast-like hold over consumers. The group believes the combination of Charter/TWC/Bright House would create a duopoly in the high-speed broadband market, stifle innovation, reduce competition, and raise costs for consumers. The group also fears that if Charter becomes as large as Comcast, the two mega companies would coordinate their treatment of programs and consumers in a way that harms consumers. While Kimmelman said that Charter should be commended for taking action to placate concerns about the merger by offering free interconnection deals to content providers for three years, it’s not enough. Jeff Blum, deputy general counsel for Dish, raised concerns about Charter’s ability after three years to impose data caps that would destroy over-the-top options like Dish’s SlingTV. On the advocacy side, George Slover, a policy advocate for our colleagues at Consumers Union, said that the merger would harm consumers and increase prices.